The 4th issue of Crawl! 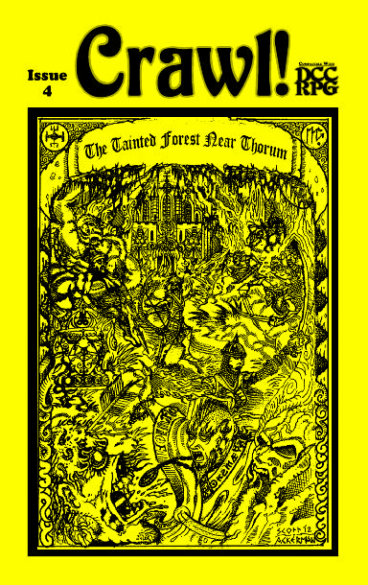 is an adventure module by Yves Larochelle and art by Scott Ackerman. 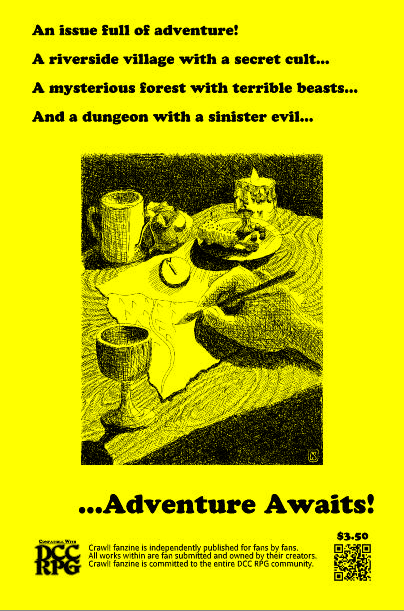 A complete adventure for 4 to 8 5th-level characters! A detailed village full of interesting locals but with a hidden secret! A nearby forest full of unique beasts including a dragon! A deadly dungeon with a sinister evil! Plus new magic items and more! So this issue of Crawl was an adventure module. It was proposed and written by Sheriffharry a while ago, and I've been working hard on it for the past couple months to make it something that fits Crawl! and at the same time I really wanted to respect and keep it as close to the original manuscript as much as possible. In the end it's still the adventure module that sheriffharry submitted, but expanded a tiny bit to make it usable, and plug-able in an existing campaign. There should be tons of usable bits & pieces, such as dozen or so unique & original monsters. A unique water dragon and a couple new magic items. There is lich-like creature and a succubus to keep you busy too. These are all wrapped up in a complete, high-level, adventure that includes a village of interesting locals, a forest full of creatures and a dungeon full of monsters and traps! I really hope you enjoy it, and let us know if you have any questions! Received today... I love it. Got mine in the mail today! Great work on this! Got this yesterday and loved it. Now to start laying seeds in my current campaign for this. This is probably the direction CRAWL! will/should go long term... only so many rules ideas you can put out, but you can always put out quick little adventures. What I like about it is the cool old school DIY feel of the art, the digest size, and the skeletal nature of it... there's not a lot of details. Some of the artifacts/magic items might be on the overpowered end, but it is for 5th levels so I'll give it the benefit of the doubt. I'd probably scale that stuff back in my own campaign, but that's not a criticism. I kinda feel like I'm looking at a modern day Tegel Manor or something like that, you know? Something really fan-produced, that was more of a labor of love than a professional profit motive. Of course I like the professional modules too, but I dunno, there's just something really cool about the size and feel of this thing that I really dig. Just wanted to share! This is really a great issue! So far, I've really liked what I've read. Awesome job sheriffharry and Rev. Dak! I couldn't agree more. I was dumbfounded when I opened Dak's package last night, and – I confess – a little jealous. Who wouldn't want their adventure to be in Crawl?! It's an awesome step, and one I didn't see coming. Here's to many issues ahead! Just got mine in the mail, and I just wanted to say thanks for doing what you do. Finally got my CRAWL! today. Three thumbs up to Dak for the editing/streamlining job!! Many good original additions. Great mood-enhancing bits. It's a great time to be a role-player...! Finally placed n order. Life got busy for a moment there. I really enjoyed No. 4! But I am waiting for blog and forum updates about No. 5 now! How about it, Dak? i just ordered all of these! They are very good! I actually think I like #4 the best. I'm a sucker for adventures. 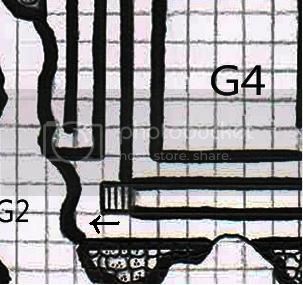 BTW, there is a slight misplacement in the dungeon map: characters should be able to access any area of the labyrinth coming down from the stairs that leads to G4. Simply move the stairs one square to the left. Cool, thanks for the correction! Hi sorry!I've been out of town, with very little Internet access. It's delayed, but completely written as of 2 weeks ago, now just waiting on art edits, and proofreading. It's a monster themed issue for October. Excellent a monster themed issue, can't wait! I'd love to see devil type entries ala the demons in the DCC RPG book! That's a great idea, unfortunately I'm not tackling with that in this issue.. maybe a future issue down the line, what kind of stuff would you like to see to differentiate the demons from the devils? Consider practical (crunch) and flavor (history & myth). Monsters are for killing, but their worlds or planes of existence might be worth the visit.